A fun thing happened: Kait’s cousin, Alison, came to find us on the road. Alison has been living a wild sort of life for the last several years: Everything she owns fits in her truck, and she has been moving every four months for seasonal jobs, living far and wide in Alaska, Idaho, Montana, Colorado – wherever the wind and work takes her. Her lifestyle is challenging, but it has afforded her opportunities rarely glimpsed by most people – living with the seasons, learning to survive on wit and will, and embracing the peace and solitude and quiet happiness that one can only find hidden away behind lonely mountains and along unmanned streams. Allison and her girlfriend, Molly, are uprooting from Colorado to chase exciting opportunities in New Mexico. Alison is a chef – among many other things – and Molly is a butcher by trade. Together, they are hoping to slice and chop their way to healthy, conscious eats for people who care about what they are putting in their bodies. 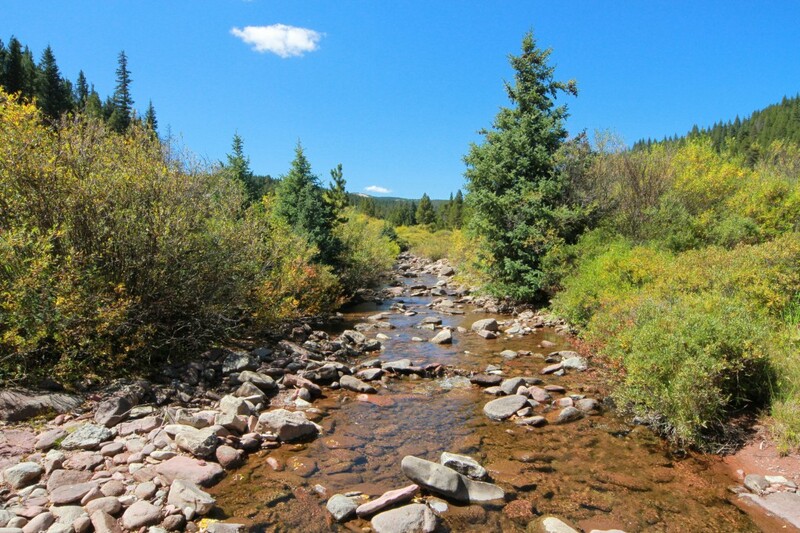 Between them, they have a great deal of experience in the backcountry – fishing for their dinner, pulling their drinking water right from the streams that flow cold and fast down through every valley in this Great State. Alison and Molly came to meet up with us before heading south, and it was a rustic adventure from the first moment. Allison and Molly brought their two dogs to the walk for a few days. Dog Parade! Alison even joined us on the day we took Vail Pass. She walked 20 miles with us, up and DOWN – a lot of down – without so much as a break. Alison is the first person to walk a full day with us, and she crushed it. We were all ached and tired and ready for campfires by the time we wrapped for the day. Kait and Allison, walking down into Vail. Always, we return to the fire ring. Through our sweatlodge of a summer, we made very few fires. Even when we camped, we only used our cooking stove for heating food. But we crossed the line from looking at the mountains to being IN the mountains, and overnight the temperatures dropped. At these elevations – 8,000′ and up – wild temperature swings and sudden shifts in weather are the norm. The sun is twice as hot and damaging to our skin up here as it was down on the plains It heats the afternoons to sweltering degrees, before it dips down in the evening and our heat disappears through the thin Rocky atmosphere. The nights have been cold, frosty, and even a little wet. And so we find ourselves here again, sitting around a fire, feeding it and thanking it for warmth, and comfort, and hot food. As quick as they came, Alison and Molly were back on the road – and so were we. It is always good to find family and new friends along the road, and Alison’s no-hold-barred approach to her life is entrancing. She tells horror stories of living without the creature comforts, out at the mercy of the wild beasts of the night. But make no mistake – she has found a freedom that we can only dream of, wrapped up in our romantic ideas of the adventurous life. Mortgages, bills, homes entombed with a lifetime of unecessary products – that is not freedom. Freedom is catching your dinner with your bare hands, and sleeping under a ceiling of stars. Our walking path has taken us through ski resorts for the last week. Up here, there aren’t a lot of children’s homes or hospitals – just ski slopes, pricey food, and nice people. 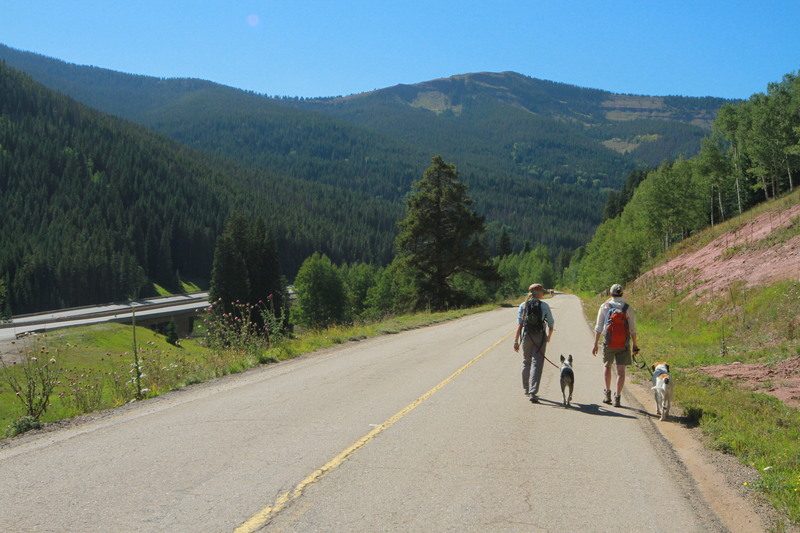 But we are finally coming down, from 10,000’+ Vail Pass, down below 8,000′ for the first time since Idaho Springs. Our path is taking us through some more populated areas, and we are planning out our next set of Therapy Visits. In the next few days, we will pass through Eagle and Gypsum, and on Monday we should reach Glenwood Springs. We hear good things about Springs. 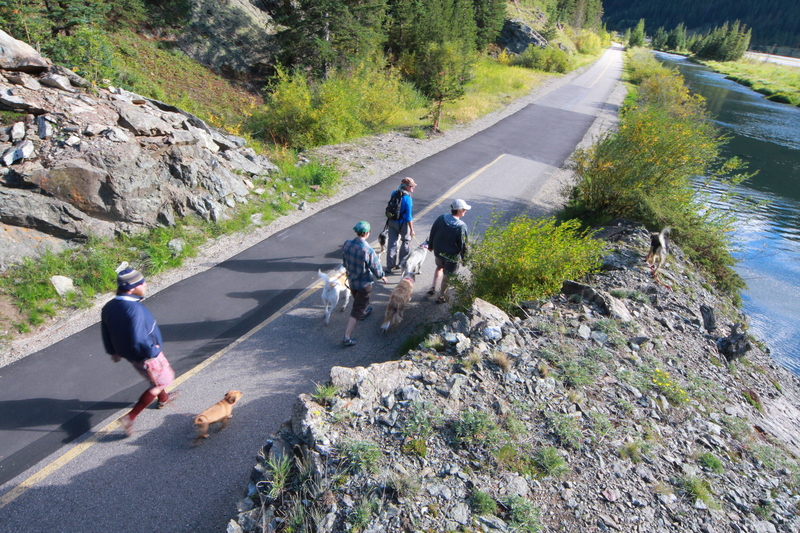 This entry was posted in Family, Trail Life and tagged across, america, animal rescue, colorado, dog, pet therapy, therapy dog, walk. Bookmark the permalink. When you sit around a fire, you know you are sharing an experience that is timeless. 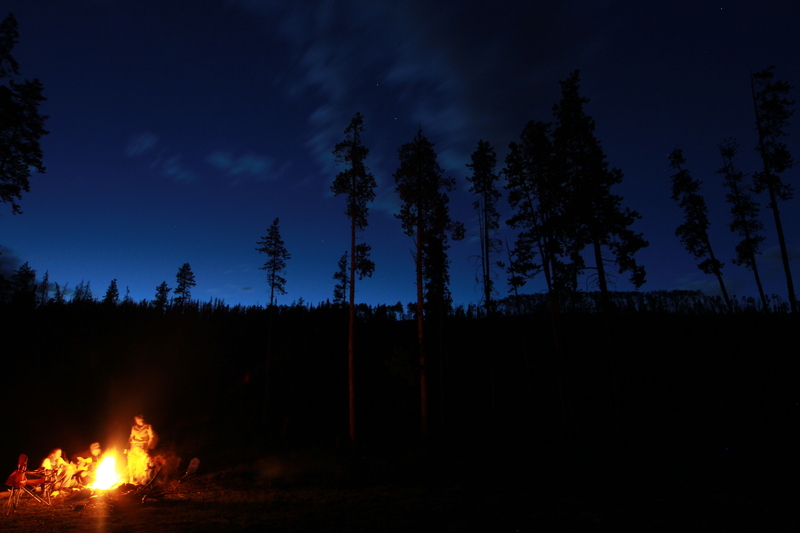 humans have been congregating in the warm embrace of firelight for thousands of years. Timeless, indeed. Gorgeous country and photos! It was very interesting to read about your friend. There are probably a lot of us that dream of such freedom, but few who actually have what it takes to live it. Thanks for sharing. Stunning photos! you will love Glenwood Springs.. perhaps you can rejuvinate at the mineral springs there, good for aching muscles. 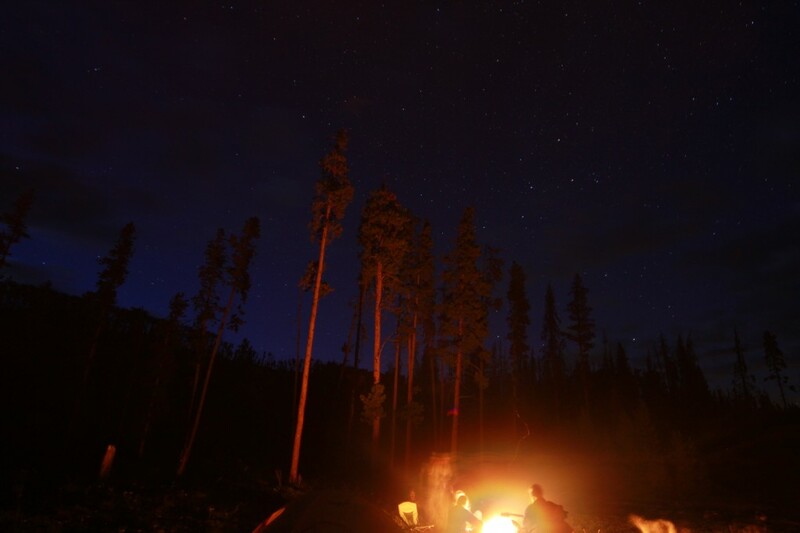 There is nothing quite like a campfire in mountains, and dark quiet at night with so many stars visible in the thin atmosphere. Blessings for the continuation of your journey and more new friends along the way. I love following this. A chef around the campfire, what a neat experience. I know that back country cuisine can be the finest. I love the peace of a campfire. Thank you for sharing.